Biking through the postcard-perfect backroads of Tuscany, stopping for an espresso and relaxing with a glass of Sassicaia afterward sure sounds like the trip of a lifetime. But what if you did all that day after day spinning your wheels next to one of the true legends of Ameircan cycling? This is Cinghiale, amici, the Italy-based bike touring company founded by Colorado resident Andy Hampsten, the only American to ever win the grueling Giro d’Italia and one of the top young riders for Team 7-11 and alongside Greg LeMond in the glorious pred-test-result-tainted day of the Tour de France. Don’t be scared off by Hampsten’s pedigree. Oh, if you want him to hammer you, he most certainly will and the thrill of pushing yourself alongside the man himself on narrow European roads is certainly a big thrill—but painful. But Cinghiale, which is named after the native Tuscan wild boar, is not about testosterone. Instead, Hampsten is truly a master at understanding the level of each rider and making the trip a unique experience for them (we rode with him on the island of Elba and one couple did the trip on a tandem). The thing that’s truly important to Hampsten is simply soaking in Italy—a country where it seems that pretty much everyone you meet along the ride, from beekeepers to archaeologists, knows Andy by name. And taking a big drink of this country means dolce far niente, or enjoying the best things in life to be enjoyed—wine, slow food, gelato, espresso and more food. After all, that is how you roll with a legend, or a pig. Hampsten rates his tours in pigs. The more pigs, the more intense the riding. 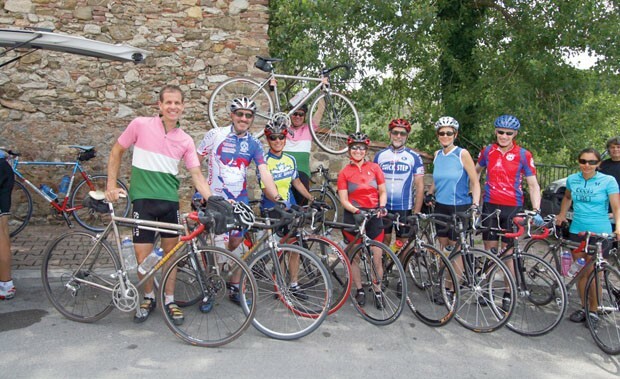 In 2012, Cinghiale Cycling Tours (cinghiale.com) will be offering a variety of options across Italy. A three-pig Barolo trip (May 26-June 3) will traverse one of the best wine regions on the planet. A four-pig Dolomiti trip (August 26-September 3) will get down to grunting with epic days on big passes. Or soak it up on a two-pig Cooking and Cycling trip (September 8-16).